In a perfect world this week would include some fabulous story about how I was snowed in all weekend and finished my entire kitchen in 3 days, had it professionally shot and called it a day. Yet, that is not how my story starts today. Get out your violins and start playing a sad song for me now. This weeks post begins like lots of stories I've heard before. I started one project, then got distracted by a pile of laundry, which got me thinking about how dirty my floors were and that they needed cleaning, which made me notice how gross my baseboards were. You see where I'm going here. I feel like I did SO much this past weekend, yet have no fabulous before and after photos to show for all my work. Just keepin' it real here folks. But I do have progress on two major kitchen projects that I've been meaning to tackle since the day I moved in (again over 5 years ago), the pantry and the under sink cabinet. This much to be exact. How all of that fit under there I have no idea. Hope you aren't eating your breakfast right now, because this picture is just nasty. But I posted it to keep it real. When I moved in I cleaned it best I could and put some shelf liners over the mess to just hide it. Like putting lipstick on a pig. 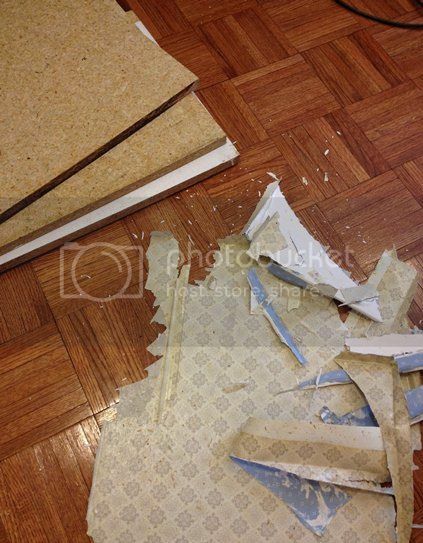 The photo above shows what it looked like after I pulled the shelf liner off. Then I scrubbed it with a magic eraser to get some of the stuck on grime. But it wasn't magic enough, it was still grimy. So I crossed all landlord/renter lines and pulled out the paint. It really was for the best. I think my landlord should pay me for these changes, right? I had a quart of some blackish oops paint from Home Depot and decided the grime needed to be covered. I painted the whole bottom and up the sides about 2 inches to camouflage the cords that were on the right side. I gave it two coats of the glossy oops goodness and let it dry/cure for a good 3-4 days. Meaning my kitchen floor was a disaster for 3-4 days. ...so I grabbed another can of my oops paints, this time I had a can of a light pinkish color, and painted the sides of the cabinet. I would have done all black, but I wanted to still be able to see what I had in there. The light color makes it easier to find items way in the back. 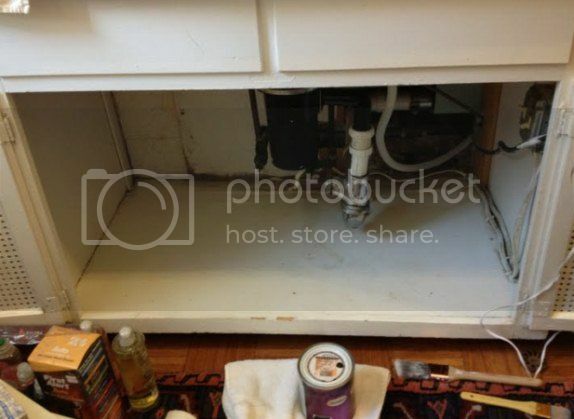 This is where my under the sink project ends. Everything is clean and back under the sink, but there are still a few more things to be tweaked in there before I can show you the after magic. 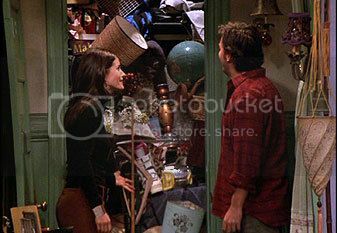 Please tell me you remember Monica's secret closet?? I had 2 large trash bags of expired cans, pasta, sauces, and just about everything you can imagine going on in there. I guess that massive grocery store run (to get the basics) when we first moved was not necessary. Note to self: I do not need 6 cans of coconut oil when I do not even know how to cook with the stuff. Big waste, HUGE. I will never do it again. A clean slate. Well, mostly clean. 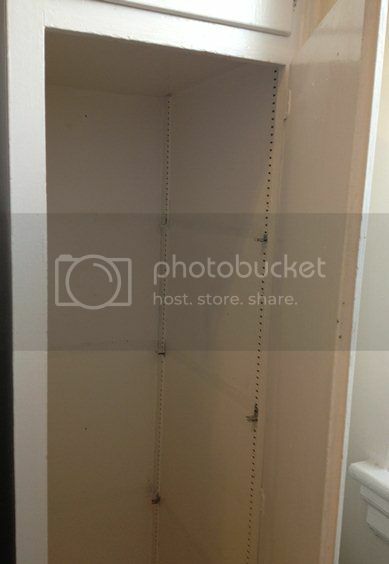 And those shelves....EW is all I can say. Apparently my landlord just painted over the LAYERS of shelf liners that had been put there before and it was a painty-sticky mess. The shelves (and the rest of the pantry) are still in the works, so you'll have to wait till later to see how they turned out. I've already used all those colors in different places and I love them! 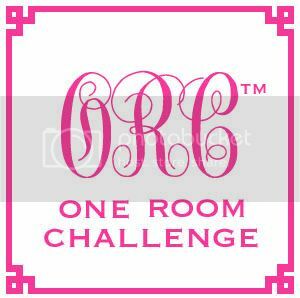 Check back in the coming weeks to see how and where I used them. 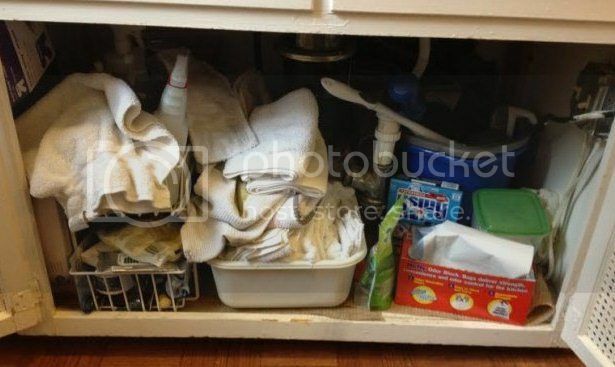 I am SO glad I'm not the only one whose under-the-sink area looks (or in your case, looked) like that! I really need to do some aggressive cleaning and organizing under there! You make me want to clean, and that doesn't happen very often! 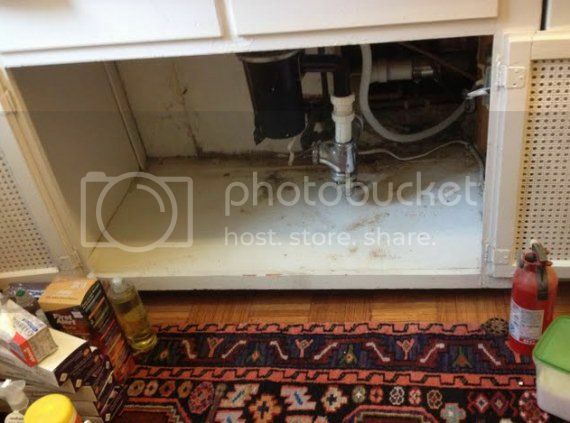 I need to tackle under my sink ONE DAY. Remind me again, please. Good luck with your projects. Youve got to feel good about purging your pantry! great job. That under the cabinet shot looks so familiar, mine is the same way. :) (the before that is). Love the colors you are using!! You've really gotten a lot done! What a great feeling to have cleaned out cabinets! I wish I could remember it better! Oh my, I try to just pretend this stuff doesn't exist in my house. It's easier that way! PS I have Ben Moore's Habanero Pepper on my front door and it's gorgeous, so I'm excited to see it in your place! You accomplished a lot!! I can't even think about cleaning out under my sink or my pantry!! 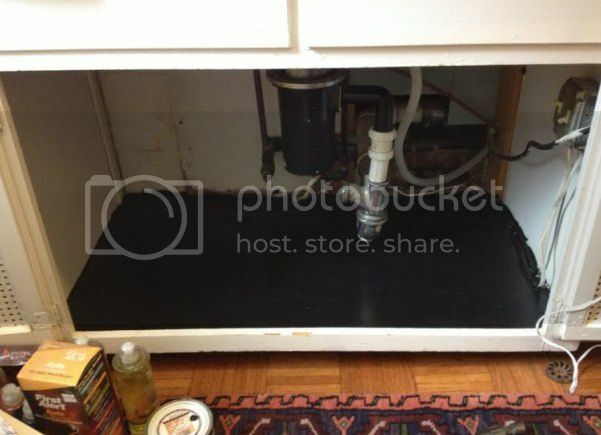 Black is a perfect under the sink color! Why all houses have white is beyond me. Hahahahaha--I love Monica's secret closet. Hilarious. It's it crazy how many cleaning supplies a person can accumulate? Love the colors you've chosen for the kitchen, btw! I bet this makes you feel so much better. I'm a sucker for a sale at the market. You should deduct your labor off your rent :). I love your color palette. Dude- I love coconut oil. Great for high heat and stir frys. Haha. Man you are inspiring me to clean out my pantry. well actually its all in a box right now, but no doubt inside the box is old, expired gross-ness. 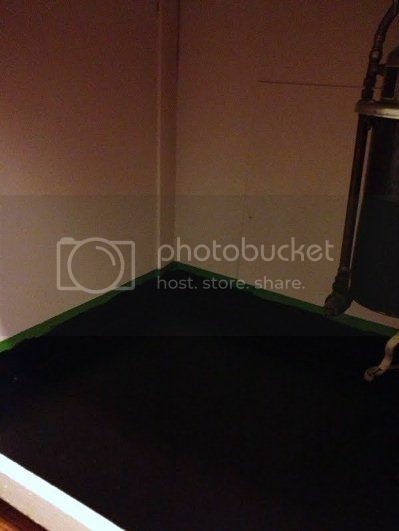 I LOVE that you painted up 2" to cover the cords under your sink, I totally get it!! Ahh, don't you feel good, I'm just ignoring mine till after ORC. :( Gorgeous color palette! I think you are going to make everyone sad after they read this post....I mean I feel guilty about under my cabinets now :( I agree though...gotta start with the ugly so you can get to the pretty! This is going to be a great accomplishment...I don't want to think about what's in the back of my pantry. 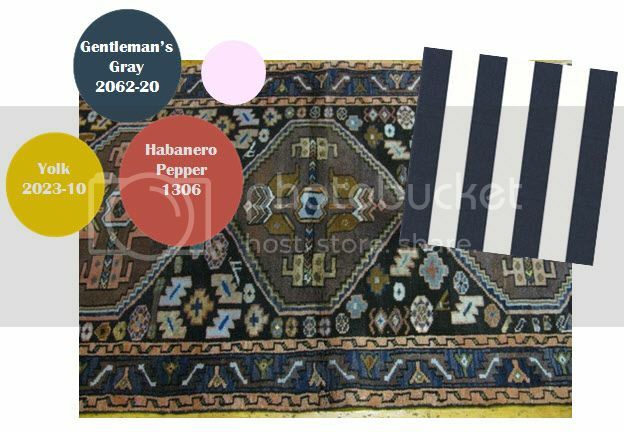 That rug is great inspiration. Love your colors. Where is the stripe going? Got my curiosity! 1. Love your plan for the kitchen, can't wait to see. 2. Use coconut oil to cook veggies and meat! Just use as you would use regular cooking oil. It tastes GREAT with veggies!! I just started using it four weeks ago and LOVE it so much I won't ever stop. 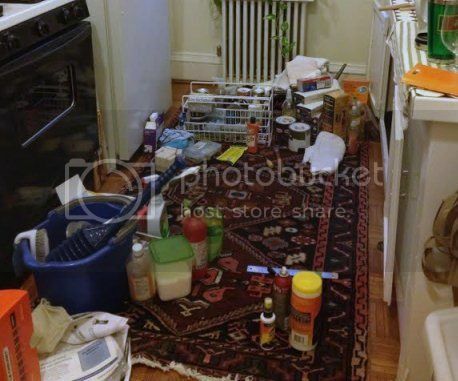 Glad I am not the only one that has a messy under the sink area, really though, how can one keep that area clean? It looks fabulous. And yes, your landlord should kiss you! Yes, I remember Monica's secret closet! Also, isn't coconut oil good for hair or dry skin or something? Your landlord is very lucky. This is going to look great! Nice job!! Huge improvement and with these bits out of the way you have a clear path to all things pretty. Love your paint combo. wicked colours!! Yes, totally remember Monica's secret closet...too cute.